BOSSY BETTY: Get Out the Superglue and Pig Bristles! It's Science Day! Get Out the Superglue and Pig Bristles! It's Science Day! I heard this the other morning and thought it was really interesting! Can ants count? Not out loud they can't. Not the way you and I count. But an ingenious experiment conducted in the Sahara suggests maybe ants do count. 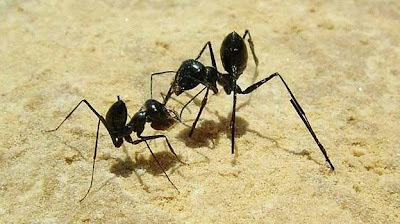 Harald Wolf of the University of Ulm and his assistant Matthias Whittlinger proposed that ants have "pedometer-like" cells in their brains that count the steps they take. How Do Ants Get Home? Does that mean ants have something like pedometers that do something like counting? Says professor James Gould of Princeton, commenting on the experiment: "These animals are fooled exactly the way you'd expect if they were counting steps." Gould says it's pretty clear ants don't have maps in their heads and don't recognize markers along the route. This experiment strongly suggests that ants do have internal pedometers that allow them to "count" their way home.